Linda’s leading the Ways to Use It Challenge at Splitcoast this week. We’re to showcase something in the yard/garden but it can’t be flowers. So my next favorite thing to flowers…leaves of course! But with spring well underway…those leaves in the garden are a long ways off and I’m happy about that! I’ve used the acrylic block technique today. 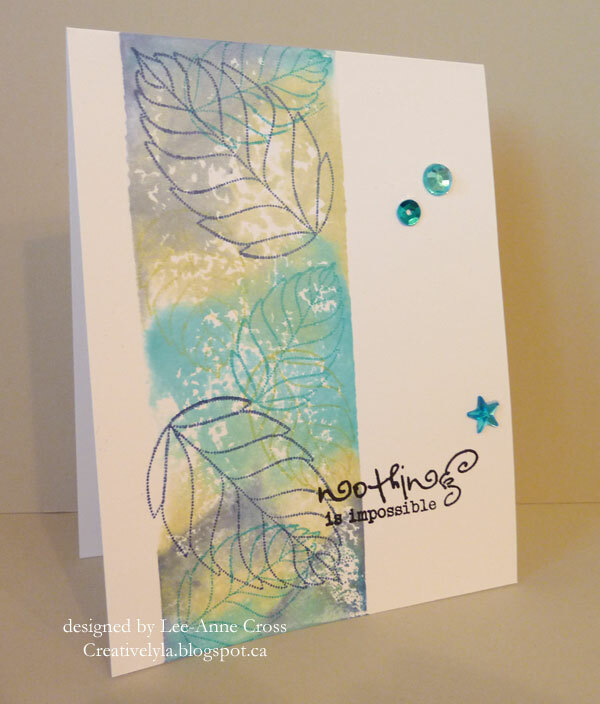 Taking a large rectangular acrylic block, I added three shades of Distress Ink in random fashion, spritzed it with water and stamped it on my card. Next, since I still had the Penny Black Dahlias stamp set on my table, I used the leaves from that set and stamped them randomly over top with the same three colors. Added the Verse sentiment and three little doodads from a set of Martha Stewart embellies that I have. Easy peasy, less than 10 minutes card for sure! Back soon with more my friends! time here at net, but I know I am getting experience everyday by reading thes nice content. Lee-Anne, this is beautiful and such wonderful colors. The acrylic block technique is one of my favorites.